The starting point in layman’s terms is to look at the Highway Code. The general rule is if a car, or motorcycle for that matter, pulls out of a side road onto a main road when attempting to turn right then they are at fault. You must give way to the traffic on the main road. Therefore, is it a straight forward conclusion that in this scenario (image to the left) the motorcyclist is not at fault? No. The problem we have is that there is another dynamic at play, the motorcyclist is overtaking a line of stationary or slow moving traffic. When overtaking you must only do so when it is safe and importantly not to overtake at a road junction. A motorcyclist is more difficult to see on the road and when overtaking at a junction is even more “out of sight” and “out of mind” especially to a motorist at a busy junction trying to pull out of a side road into a gap in the line of traffic. A brief opportunistic window appears, someone leaves a gap in the traffic or is “flashed” to come out. 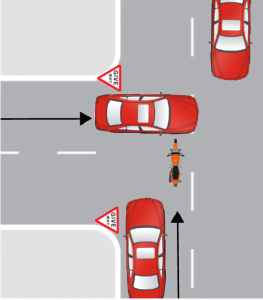 Rightly or wrongly the car pulls out, the motorcyclist does not see the car and vice versa, so the collision occurs. Solicitors will refer to the Highway Code but the code is not binding on the judge. The judge will determine blame of the facts of the case. The case of Powel v Moody is a situation always raised by a motorist’s insurance company against the solicitors acting for the motorcyclist. In the end, solicitors acting for both parties have put themselves in a position where they find it difficult to see each other which is why the accident happens. Thec ourts therefore tends to rule that both parties are equally at fault. The judge will apportion blame on a 50/50 basis which means that the motorcyclist and motorist will have their compensation reduced by 50%. If there is a claim and counterclaim, both will forfeit their no claims discount as well as the insurance excess. To find out more about our No Win, No Fee advice service, visit our about us page. Whatever your situation, you will not have to worry about legal costs and instructing experienced and specialist solicitors.